I’m the Project Officer for the Centenary of WWI Community Committee documenting the servicemen and women who signed up for the war in Orange. The main aim is to identify men and women from the area and commemorate them by telling their stories on the website. I start with the National Archives of Australia because all their attestation papers and war records have been digitised, then the Australian War Memorial. Honour rolls from the districts, churches and schools and information provided by the Orange and District Historical Society. We also received a grant to have the local papers digitised during the war period for local papers through TROVE, so I can search there. I also use the Library’s Spydus database. Members of the Orange Family History Group have been going through The Central Western Daily looking for births, deaths, marriages and obituaries, so a search through them often I’ll find out more about a returned serviceman’s life through an obituary – like whether he married or had children. Other than that, I just google their names and that often brings up the Family History newsletter and local studies history books and resources with books on Lucknow, Spring Hill and Lis Edwards’ books often mention family names. What Response Have You Had? All the stories are outstanding. 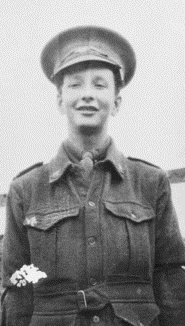 The story of the youngest to enlist Ernest Lachlan Powter is moving. The story of friends Rocky (Deputy Town Clerk Herbert Rockliff) and Bun (Bernard Kelaher) – two mates who boarded together at Dover House, enlisted together and both of them died during the war. For more stories read he latest edition of the Orange Family History Group Newsletter.